New York Times bestseller Melissa Jo Peltier turns her attention to the brilliant, back-stabbing world of prime-time television in a wickedly funny new novel. Peltier has worked in entertainment for more than 20 years, making the darkly funny Reality Boulevard a true insider's view of Hollywood and some of America's biggest shows. In it, we see Oscar-winning producer Marty Maltzman and his staff out of a job - and out on the streets - when long-running docu-series Lights and Sirens is unexpectedly axed. But the Hollywood the team now faces is full of Kardashians and Real Housewives, and they need to survive in a world where it's very hard to tell what's true and what isn't - both on and off screen. Oscar and Emmy winning documentarian and veteran reality producer (Big Brother, Rescue 911) Arnold Shapiro called the novel "the best satirical look behind the scenes of reality television ever written," adding: "It contains more truth than you would believe." Todd Milliner, producer of Grimm and Hot in Cleveland, said: "During her 20-plus years in the business, Melissa Jo Peltier has had a front-row seat, watching it all unfold. In this novel, she puts her dry wit and storytelling ability to good use, pulling back the curtain to reveal what really goes on." Peltier is a double Emmy Award-winning writer and producer behind international hits such as TV's Dog Whisperer, recent multi-festival indie feature White Irish Drinkers, and co-author of seven non-fiction books including five NYT bestsellers. In 1992, her multi-network simulcast Scared Silent hosted by Oprah Winfrey was hailed as television's most watched documentary ever, and earned Ms. Peltier the coveted Humanitas Prize. 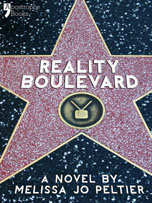 Reality Boulevard has been produced by the innovative London e-publisher ApostropheBooks.com. It goes on sale this week to owners of every major device, including the Kindle, iPad and Nook, as well as being available to download from more than 1,000 retailers around the world. For more details about the e-book, visit www.apostrophebooks.com/realityboulevard. Melissa Jo Peltier has been honored for her film and television writing, producing and directing with two Emmys, a Peabody, Humanitas and more than fifty other awards and nominations. An executive producer of the thrice Emmy-nominated and People's Choice winning reality series Dog Whisperer with Cesar Millan, she co-authored five New York Times best-selling books with its star, along with two more non-fiction titles. Melissa is a co-founder of Burbank-based MPH Entertainment, Inc, which has created over 350 hours of original non-fiction and reality programming. Her dramatic work includes writing the Lifetime movie Nightwaves and The Collector, for the hit CBS series, Ghost Whisperer. Most recently, she produced the festival-winning indie feature, White Irish Drinkers, for New York-based Ovington Avenue Productions, of which she is also a principal with her husband, film/TV writer/director John Gray. She is represented by Scott Miller at the Trident Media Group. "Harder to look away from than a bad car wreck on the freeway. This wickedly funny book confirms any and all suspicions about the nature of the machine that churns out the endless sausage known as reality TV programming. The characters are too spot on for them not to be, well, um, from reality! For anyone who has ever felt their IQ plunge as they cursor their remote through the ever- diminishing menu of worthwhile television programming, this book administers an antidote for the disgust and ennui. It is beautifully crafted and mercilessly funny. The "Network" of reality TV, this one needs to be turned I onto a major motion picture and soon!"